Imagination Technologies posts 53% rise in pre-tax profits | What Hi-Fi? Here's a spot of good news among all the economic doom and gloom. Imagination Technologies, parent company of Pure – make of digital radios and streaming devices – has seen its full-year profits rise by a healthy 53%. Imagination made £36.8m ($57.7m) in adjusted pre-tax profits on revenues up 30% to £127.5m for the year to 30 April, the company announced. 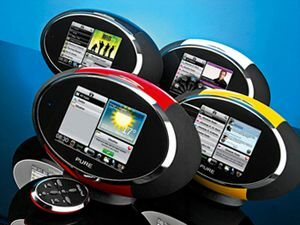 Revenues from digital radio arm Pure were up slightly from £28.3m in 2011 to £29.3m, with strong overseas growth offsetting a "tough UK retail environment". The firm's technology can be found in mobile phones, tablets, games consoles, digital radios and TV set-top boxes. It includes the likes of Samsung, Apple and Intel among its customers. Recently the company has expanded into audio streaming and this month took a 10% stake in UBC Media, the audio and video content producer. Chief executive Hossein Yassaie says: "Despite the global economic environment, over one million devices are now being shipped with our intellectual property daily. "We remain very confident of our continued good progress given the growing demand across our IP families, the growth in design wins across a widening range of end-user markets, and the momentum in our partners' chip volume."